In the fall of 2013, I decided to take the leap into fully embracing unschooling, which in essence is child-led learning with parental accompaniment. I went from being a very relaxed homeschooling mom to now really relinquishing as much control as reasonable over my children’s lives with the hope that we can have a mutually affirming and enriching environment for all. One of the challenges for me of fully partaking of this lifestyle is the need to spend as much time with my kids as is possible…being a part of their lives as I invite them into mine when I’m not running around with other home responsibilities. So, a few months in, still longing to see myself step down from my parental tower and delight in child’s play, we discovered, during a visit to the hairdresser, LICE! At first, I just couldn’t believe it since we’d spent so much time home, but there it was…clearly developed on one head and just beginning on the other three as well as myself. I grew up being known even by students that didn’t go to my elementary school as the lice girl. I was known supposedly because I was the one that would find lice on my head and go report myself to the nurse. It had become standard protocol because it happened so often. My visits to Mexico included an importation that I didn’t pay duties for but that I paid for later in my small town reputation. My mom grew up with lice constantly as well and experiences trauma with just the thought of it. So, when it inevitably happened to my family, I was slow to freak but knew it’d be a long road because of being a family of 6 and with boys that would not want to cut off their hair and a 3 year old girl that never has her hair combed. I wondered about our lice and asked the heavens what might this mean for us. I was annoyed at first with the disruption, but as I began the tedious process of combing through strand by strand, it was clear that I was breaking down some of the walls in our relationships. These are some of the lessons I learned. 1. I really needed some one-on-one time with each of my kids, and lice gave me the opportunity to just sit, take care of them, and watch some of their activities without my direct involvement. It pushed me to just be quieter and present. 2. Lice taught me that it’s okay if we’d just stay home. I was anxious to leave the house to do stuff, but lice allowed me to be in my home and love it. 3. I need to learn to be gentle with my kids. 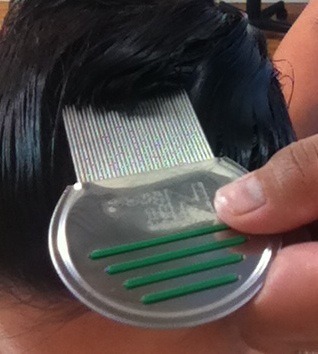 It’s easy to be careless with the nit comb and pull their hair, but it was a great exercise in listening and being as careful as possible to their needs and meet my needs of getting lice out. 4. My hair actually needs a good oil treatment probably weekly. With the natural oils that I applied and the nit comb, I was totally loving my hair. LOL. That was a more personal benefit, but for a mom of 4 kids, a total plus. 5. Hopefully with my generation, I can break the generational trauma around lice. Lice is gonna happen. It’s a part of our life, but I definitely wanted to keep at a distance any stigma around it for my kids, and make it a funny part of what happens in life. Uneventful. A thing that happens and we take care of. 6. And secretly, don’t tell anyone, I do love the sound of crunching lice between my nails. It’s the sound of victory. So, reflecting more deeply on the quote above. What if all that comes my way, I refused to fight and resist it. What if I in my heart embrace it, whatever it may be: spilled chocolate milk, toilet overflowing, mud being trailed in, parasites, fleas, a feverish child, heater breaks, down to one car, losing a job, or your home burning down, what if we received it for what it is. Resisting it will not make it go away. Worry will not make it better. Choosing it, maybe even seeing it as a gift to show us something we haven’t been willing to see, can be the break into freedom we’ve been needing all along and the break into clarity to show us the way. This ability to live fully in your life and flow as it goes is transformational. Tags: children, family, homeschooling, kids, lice, parenting, unschooling. Bookmark the permalink. oh Kel, I just had to laugh at some of her comments and immediately thought of you, of course. How’s it going??????? ?